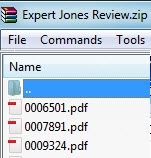 This technical note will show you how to share documents with expert witnesses. >Expert can review integrated LEP case. >Documents can be referenced with same Doc link. >Expert cannot see any coded data, notes, facts. >No folders or other coding for Expert use. >Documents can be downloaded only one document at a time (but this can be handled by simultaneously creating a download Briefcase and shared link for all docs and then the Limited User access can be used as well). >No search or other Lexbe eDiscovery Platform extended functionality. Create a Second Case >We can create a second case and download copies of some documents from the main case. That second case can have outside experts or other users as an Admin Account, that will be able to process and organize documents. There is no set up charge for that, but we do charge $10/m for billing of the second case. >Trouble to copy and create a new case (can be requested as Lexbe eDiscovery technical service). 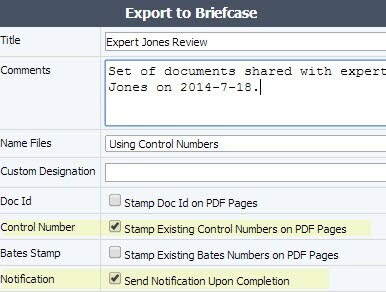 Create Briefcase for the Expert (Offline) >This option allows you to share files and documents with persons outside Lexbe eDiscovery Platform by download documents to a briefcase, and then sending the documents using a shared download link or copying the briefcase to a flash drive, CD. Review Document Offline >No search or other Lexbe Functionality. >Must be downloaded or transmitted at one time. >Control numbers must be run first to make links click-able locally. * Click on the 'Add Coding Field' hyperlink and create check-boxes title named 'Expert Smith Review', 'Expert Jones Review', etc. a) 'Multi Doc Edit'. You can use the ‘Multi Doc Edit’ function from the Browse or Search pages, select multiple files you want to tag by marking the check-box to the left of the documents. b) 'Discovery Tab'. the information needed for a custom field can be coded 'one at at time' from the Document Viewer>Disc tab, during privilege review. Once you identify the documents, you can also download an Excel spreadsheet to keep a record of which documents the expert(s) had access to. This feature is available from the Browse and Search pages, under the section 'Export>Export Log to Excel'. d-On the 'Control Number' section you can also select 'Stamp Existing Control Numbers on PDF Pages' if desired). After exporting the document to a briefcase, you can either 'Go to Download Briefcase Page', 'Stay on Current Page' or 'Cancel Briefcase' action. You should expect an approximately 10 GBs/day rate (~200,000 pages) within your Lexbe eDiscovery Platform account (combined all cases) to create Productions (including Bates numbering) for Standard PDF productions and 2.5 GBs/day rate (~50,000 pages) if TIFF Productions are selected. Your download time is in addition to this, and will depend on your internet download speed. PDF productions will be approximately the size produced, while TIFF productions expand significantly (generally 3-10X, but sometimes substantially more depending on the specific files). We also offer Project Management and Technical Services if engaged to support your document review efforts by helping to efficiently execute specific requests for document identification and metadata upload. Please contact your sales rep or our Support Center if needed.